The home farm is called 'Elderslie' and is about 116 hectares (300 acres), we use the front 84 hectares for the milking cows while the remainder is quite steep so we use that for when the cows have their yearly 6-8 week holiday. Our farm is one of great diversity, with numerous different species of plants and animals to attend to every day. Peter and Ash are in charge of the dairy while I share the morning milkings so that everyone gets a couple of sleep ins for the week, while Toby and myself take care of the egg production and garlic. Along with these we also have sheep, pig's ducks and a camel just to keep the neighbours amused . So there is always something to be done. Our cows are milked twice a day every day (yes even Christmas day) and have access to fresh pasture after every milking. We have a very diverse pasture with as many different grasses and herbs as we can so that the cattle can pick and choose what they want or need to eat. Our cows calve in two different groups for the year so half of the herd calve in the autumn and the other half calve in the late winter. This is to make the best use of the peak grass growing times. We are still developing the farm in terms of having shade in every paddock so when the weather is going to be too hot or cold we make sure that the cattle/chickens are in paddocks that have good natural shelter. We are a certified organic farm so that means that we don't use any chemical fertilizers or chemicals on our pastures. The fertilizers that we use if we do use any are things like lime or rock phosphate that are naturally occurring minerals. We don't use herbicide or pesticide sprays on our farms and our cows/chicken are treated with natural products such as garlic and apple cider vinegar so that the use of antibiotics is very rare indeed. We also make our own compost from the resources that we have on the farm such as calf shed waste and cow manure. This is very beneficial for the soil and is either made into a compost tea and sprayed on to the pastures or applied directly onto the pastures. The waste water from cleaning the cow yard is also stored and used as a fertilizer on the farm. The other form of fertilizer that we have is our chickens whom have a bit of a different lifestyle. 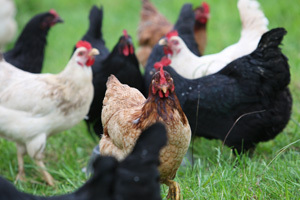 Our chickens live in caravans that have been specially fitted out for them. Everything that the chickens need is in their caravans which are moved around the farm so that their manure fertilizers the pasture. Their eggs are collected twice a day first when we feed the chickens and their protectors (Maremma Dogs) their milk in the morning and then again late in the afternoon when we feed the dogs their dinner. The Chickens do not need to be locked in at night thanks to the Maremmas's who keep away the foxes and wedge tail eagles that would prey on our girls. So they are free to get up at dawn and go to bed at dusk just as nature intended. Our other farm is Called 'Glendearg' and is about 33 hectares (82 acres) in size. We use this farm to raise all our young stock (replacement heifers) and to grow our garlic. The garlic crop is a small one at the minute as we didn't want to buy in seed so instead we have used the seed stock from garlic that has been growing in the family orchard for as long as Peters dad Tom can remember(Tom is 85). The first chicken caravan for this farm has just arrived and they are making themselves at home.